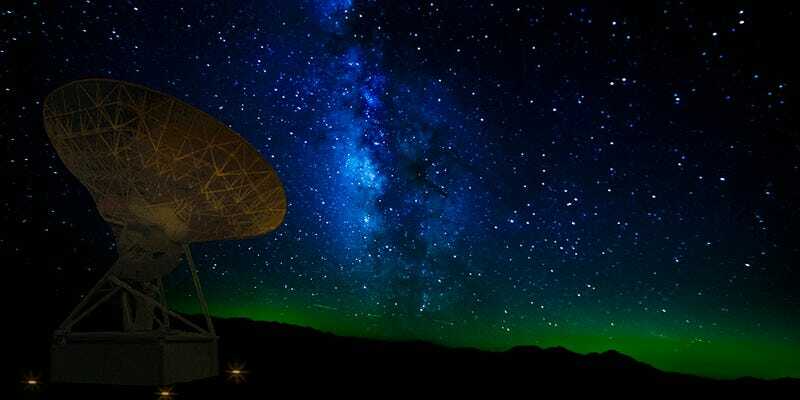 The launch of the $100M Breakthrough Initiative project to Search for Extraterrestrial Intelligence (SETI) has been supported by many leading scientists including Stephen Hawking and astronomer royal Martin Rees. But there is no evidence – and few convincing theories – to suggest that intelligent, communicative aliens actually exist. So are listening projects really the best way to search for extraterrestrial life? The possibility of life outside our own planet has been the subject of debate for centuries, with the essence of the problem crystallised by Italian physicist Enrico Fermi in 1950. His now famous “Fermi paradox” runs simply: if intelligent life exists elsewhere in the Galaxy, then why do we see no evidence for it? We now know that planets around other stars are very common. Since the first discovery of a planet orbiting the star 51 Pegasi in 1995, around 2000 exoplanets have now been found. Most of these are close by – within a few hundred light years. Statistical analysis of the results from the Kepler spacecraft suggest that as many as one-fifth of all sun-like stars has an Earth-like planet in its habitable zone, where conditions are such that liquid water could exist. So if planets are so plentiful, then what about life? The Drake equation, formulated by Frank Drake in 1961, attempts to answer this question by suggesting there could be many civilisations in the Milky Way that we should be able to communicate with. However, while many of the terms in the equation are now known fairly well, others are highly uncertain. But let’s assume for a moment that such civilisations do exist. If they do, then might we notice them? A straightforward way for an alien civilisation to make itself known is simply to colonise the galaxy. Let’s consider how long this might take, assuming technology that is not too far away. It would be possible now to build probes that could be sent out into space to search for other planets, land on them, and build replicas of the probe that could in turn be sent out to other planets and so on. At the sort of speeds we can now imagine, such as that achieved by the New Horizons spacecraft (60,000 km/h), it would take a mere 18,000 years to travel a distance of one light-year. Let’s assume such a probe were sent to a planet ten light-years away, arriving after 180,000 years. It then builds ten copies of itself, and sends them off to other planets, each a further ten light years-away. In this way it would take only 5,000 probe generations to fill the entire galaxy – an accomplishment that would be achieved in less than a billion years. But it’s not hard to imagine that an advanced civilisation might produce space probes that could travel significantly faster than ours currently do, so colonising the galaxy in just a few hundred million years is not unlikely. But here’s the thing: the Milky Way has existed for around ten billion years, and we know that some planets exist around stars that are almost this old. So if intelligent life really is common, the likelihood is that it evolved elsewhere to our stage of intelligence several billion years ago, giving it plenty of time to colonise the galaxy. So where is everybody? Are we all alone …? Entire books have been written exploring the various solutions to the Fermi paradox, but they fall into the following general categories. Rare Earth: It may be that there are no civilisations in the galaxy any more advanced than we are. Perhaps the combination of astronomical, geological, chemical and biological factors needed to allow the emergence of complex, multicellular life is just so unlikely that it’s only happened once. Doomsday: Perhaps life and civilisations emerge often, but it is the nature of “intelligent” life to destroy itself within a few hundred years?. The human race certainly has no shortage of ways of accomplishing this, whether it’s via physical, chemical or biological weapons of mass destruction, or as a result of climate change, or even a nanotechnology catastrophe. If life doesn’t persist very long on any planet, we shouldn’t expect to see much evidence of it around the galaxy. Extinction: Even if we don’t wipe ourselves out, perhaps the universe conspires to eliminate civilisations on a regular basis? It’s clear on Earth that there have been at least five mass extinctions. Some of these may have been triggered by the impact of massive asteroids, but other possible extinction causing events might include nearby supernovae or gamma-ray bursts. …or are the aliens just hiding? There is another class of possible solutions to the Fermi paradox that boil down to the fact that alien civilisations do exist, but we simply see no evidence of them. Distance scales: Perhaps civilisations are spread too thinly throughout the Galaxy to effectively communicate with each other? Civilisations may be separated in space, and also in time, so two civilisations just don’t overlap during the time that they’re each active. Technical problems: Maybe we’re not looking in the right place, or in the right way? Or maybe we just haven’t been looking for long enough? Perhaps we’ve not recognised a signal that’s out there, because the alien civilisation is using technology that we simply cannot comprehend. Isolationist: Perhaps the aliens are out there, but they’re choosing to hide themselves from us? Perhaps everyone is listening, but nobody is transmitting? It may be that other civilisations know we’re here, but the Earth is purposely isolated, as if we’re some kind of exhibit in a zoo. Finally, there are of course the more extreme possibilities such as that the Galaxy that we observe to be empty of life is a simulation, constructed by aliens. Or perhaps the aliens are already here among us. Such speculation is great for science fiction, but without evidence, it’s not worth pursuing further. My own hunch is that life is indeed common in the galaxy, but intelligent life is rare – either because it doesn’t evolve very often, or it doesn’t last very long once it does. For that reason I think that SETI programmes are probably doomed to fail – although I would love to be proved wrong. Instead I think the best chance of finding life elsewhere in the galaxy is through spectroscopy of the atmospheres of transiting terrestrial planets. That will be carried out by missions such as such as the European Space Agency’s PLATO spacecraft, due for launch in 2024. Such life may just be a green slime that we can scrape off a rock with our finger, but its detection would truly transform our view of the universe, and ourselves. Andrew Norton is Professor of Astrophysics Education at The Open University. Image by encouragement under Creative Commons license.